What's new about Tenerife Omnibeach Puerto de la Cruz? Tenerife Omnibeach was not really the name for a beach. Now hopefully, somebody will bring it back to life. Read on...The name by which it was often discovered was Tenerife Omni beach, also.You are welcome to see what it used to be. Why? Well, the place has been closed down and doesn't exist any more by that name in 2014. 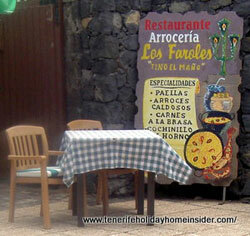 All you read now is " Restaurante Los Faroles" and that is not operating either. We are in 2018 now and new people manage the place under a new name. However, I didn't spot anything that really attracts me and the place isn't exactly humming. I shall keep you posted if the situation changes. See part of it pictured above, where a construction in the back was housing the inside bar and disco. More sections were to be found in its extensive garden with different niches for eating out, while some were under big old trees. Everything was faced by a cottage which housed a picturesque bodega. Food at its main restaurant the former Los Faroles seemed to be popular. 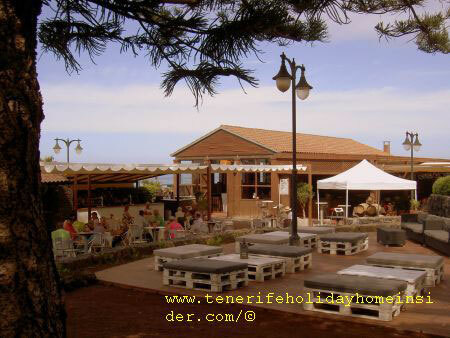 Indeed, we discovered about 20 happy faces of tourists at Tenerife Omnibeach. They all ate lunch there on February 26, of 2013. By the way, a colorful wooden fishing boat created a focal point to the interesting set-up. Children meal at family restaurant beach club. 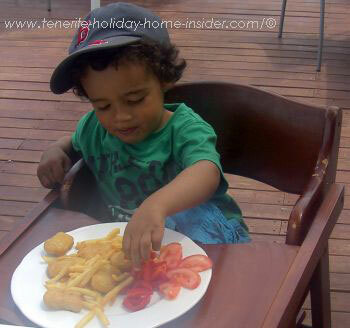 The following photos of May 2013 show why Omnibeach Tenerife was most practical and pleasant to eat out as a family restaurant with little kids. Discover an ideal children meal which was consumed outside. It shows French fries, softly baked chicken peaces and tomatoes. It obviously appealed to the very young, such as the two year old Samuel. Note the kiddy high chair which was provided by Omni Beach. 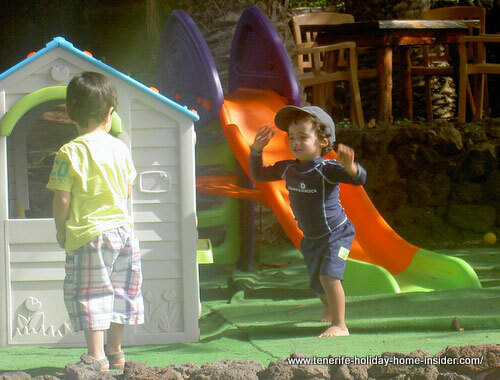 Certainly, not only little kids were making friends at this care free beach club for eating out in Puerto de la Cruz. Others with little children also took their lunch, while we were there which was not in high season. This Puerto de la Cruz garden restaurant was so conveniently located on Playa Jardin. Also, you could keep an eye on the little chaps from all kinds of angles. Why? There were several locations to pick a seating. You were served above, beside, or below the playground of the Tenerife Omnibeach beach club. There was no need to dress up for eating by the Omni playground for little kids. Funky jazz music was heard when we had supper there on the same day. A live rock concert was on the agenda for later on. We had fish soup which my friend from the Netherlands liked very much. I found it slightly salty. One of our ladies had porc chops with vegetables. We sampled Salmon, Dorada seafood with rice, Mackarel with potato salad and and various cold fish tapas with salads. All was good Mediterranean food. However, the Porc meat was served too fast and we had to give it back to be fried some more. By the way, there was also a colorful jumping castle for even more fun. It was also suited for bigger kids. Small soft balls were scattered on the ground. Toddlers love to throw them. Sand on the floor of the small woodland changed over to a timber boardwalk by one of the main terraces. Tenerife drink prices were not expensive at Omni, as the locals called it for short. Often, restaurants charge a minimum for food, while they make up its loss by adding more to drinks. You could encounter a drinks bill board, as portrayed by the photo beside. It was by the ocean promenade. 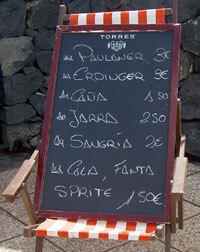 It was rather fair for a fancy beach club in the year 2013 to get drinks of the Spanish Cava champagne or a Cooldrink, such as Coke or Fanta for €1,50 each, while Sangria set you back €2, only. By the way, we even paid less for a coke during a 3 hour live jazz concert there. I myself paid only Euro 2 for a large can of Heinecken beer. That's cheap for a night club outing. Indeed, Puerto de la Cruz is much cheaper for going out than Los Christianos and Playa de las Americas. Omnibeach was on Playa Jardin Puerto de la Cruz with its slightly different three beaches. It was almost a stone throw from the renown Loro Park of the Canary Islands. It was in a prime position just above the stunning Playa Jardin waterfalls. The restaurant los Faroles which was there before, as well as a Pizzaria were incorporated into the center. An interesting fact is that the landscaping of this Tenerife North Garden Beach is an ideal base for a multi purpose center of culture in this oldest resort of the biggest Canary Island. So what was new at Omni beach in 2013 ? You could enjoy Sunday lunch barbecues or teas when kids entertainment would be organized by the center from mid morning to mid afternoon from November until Easter. There was a dance floor for all ages at Tenerife Omnibeach where even techno music was part of the scene. I've been there. No entrance fee, by the way... The band was playing outside on a podium on the right which is not in the photo. They were doing great, as usual. Attendance was pretty good. Note that ladies should bring an extra top with long sleeves, just in case that those hot summer nights are not there all the time. Of course, the Omni holiday resort invited for special New Year's Eve events, too. This information has been provided by my Argentinian IT technician Julio Diego of Toscal Longuera who was praising the Omnibeach center as ideal for his age group of Thirty Something for going out at night as alternative to his beloved top Adeje nightclub. By the way, the fans of Tenerife Omnibeach seem to have changed somewhat since the onslaught of 1500 Techno mad youth on that Saturday of July 2012. More were hanging out by the beach sand and by the road side on that night. Behavior got much out of hand, from what I understand. After that, the club's music was more geared towards better behaved visitors, by the looks of it. From Tenerife Omnibeach back to Puerto de la Cruz where cultural activities have always been priorities.